Dr. Jessica Zitter, the subject of a new Netflix documentary, says that patients and doctors both are in denial about death, and that denial leads to more suffering than it saves us from. From the time she was a young girl playing with her surgeon father’s doctor bag, Jessica Zitter wanted to save lives. In medical school, Zitter specialized in critical care, which she saw as “the ultimate hero’s specialty,” and later became an Intensive Care Physician. 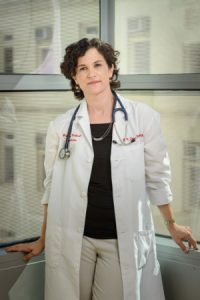 As a young intern working on an ICU, she never imagined that, twenty years later, instead of trying to prolong lives at all costs, she’d be working to help patients experience what she calls “a good death.” Now, in the Intensive Care Unit at Highland Hospital in Oakland, California, Dr. Zitter leads a team that helps terminal patients prepare to die. 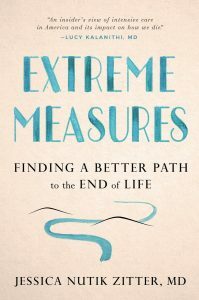 Her work is the subject of the Netflix documentary Extremis, as well as the focus of her recent book, Extreme Measures: Finding a Better Path to the End of Life. Zitter’s current medical practice, a rare combination of Intensive Care and Palliative Care, evolved in response to a trend she observed in the medical world: Both doctors and patients have a tendency to avoid talking about death—a form of collective denial that “fuels a tremendous amount of suffering.” One in five people in the United States dies in an Intensive Care Unit, usually in cold and clinical surroundings, isolated from their families. Elderly and terminally ill patients are painfully intubated and catheterized before dying on what Zitter has dubbed the “End of Life Conveyer Belt.” While desperately working to keep patients alive at all costs, doctors often don’t realize when these efforts cause more harm than good. In Extreme Measures, Zitter makes a compelling case for increasing compassionate, patient-centered palliative care in the modern medical establishment. Through rich patient histories drawn from her work in more than twenty prestigious hospitals, she chronicles her shift away from the ICU’s fervent push to prolong lives at all costs and toward holistic palliative care. Here, Zitter discusses the fiery nurse and two patients whose end-of-life experiences shaped her thinking about palliative care, and the need for revised societal approaches to talking about death. Dr. Zitter’s epiphany moment came in 2003 when, as a new attending at University Hospital in Newark, New Jersey, she was about to insert a catheter into the neck of a dying patient. “There is probably no turning this around,” Dr. Zitter remembers thinking—the patient’s kidneys were failing, her liver was shutting down, her blood pressure had plummeted dangerously low, and the acid level in her blood was dangerously high—“but we might as well give it a try.” For doctors armed with miraculous life-extending technologies, letting a patient die often feels like failure—or a kind of murder—even when it’s the most humane option. By the time Dr. Zitter met Vincent, an 85-year-old nursing home resident in Newark, New Jersey, he “was no longer really with us,” Zitter writes. He had entered the ICU with septic shock from pneumonias caused by food coughed into his lungs, which required surgeons to sew a feeding tube sewn his stomach through which artificial nutrition could be pumped twenty-four hours a day. “The only signs of life occurred during dressing changes and bed turning when, despite extra medication, pain fired up in dormant neurons and his blue eyes flared,” Zitter writes. Long before they are ill and can no longer speak, people need access to the kinds of resources than can enable them to make truly informed decisions about how they want to live their lives. Legally, Dr. Zitter and her team had to follow this Advance Directive, which meant they used technology to “keep Vincent’s body going even while it was trying its hardest to die,” Zitter writes. Over the course of nine visits to the ICU, Vincent had a breathing tube sewn permanently into his neck, as he’d become too weak to support his own breathing, and a tube sewn into his bladder because of his chronic urinary tract infections. On the ninth admission, “this man’s body was being eaten away to a degree I had never seen,” Zitter writes. A month later, he died during continued deliberations—after suffering that Zitter viewed as needless. “She was so relieved to know there were options for care other than the chemotherapy that was ruining what remained of her life,” Dr. Zitter says. “We must be able to offer a variety of approaches to patients with serious and terminal illness, including palliative care and hospice. That way, we enable them to make choices aligned with their own values and preferences.” Marcia got “four good weeks at home,” playing Scrabble with her children, snuggling with her grandchildren in her hospital bed, and drinking good wine. She died at home in her daughter’s arms. Dr. Zitter attended her funeral—a “celebration of her life”—at which the family thanked her repeatedly for giving them the time with her that they had. The cover to Zitter’s book, Extreme Measures. 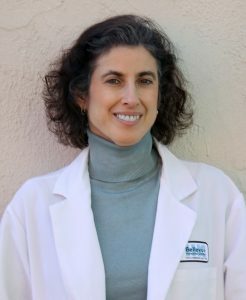 After more than two decades practicing medicine and chronicling the relationship between physicians and patients, Dr. Danielle Ofri has a unique understanding of the doctor-patient relationship. She’s written numerous books about the experience of practicing medicine, how physicians’ emotions impact their work, and about her own experience of transitioning from physician to patient. In addition to practicing medicine at the nation’s oldest public hospital, New York’s Bellevue Hospital, she is the co-founder and editor-in-chief of the Bellevue Literary Review and teaches medicine at New York University. Danielle Ofri. Photo by Joon Park. 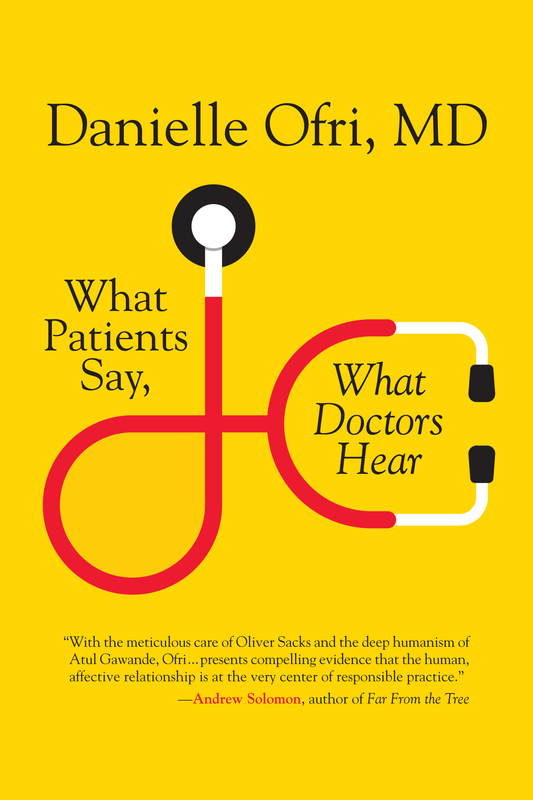 In her newest book, What Patients Say, What Doctors Hear, Dr. Ofri investigates the ways patients and physicians speak to and hear one another, and how this impacts physicians’ ability to perform medicine, as well as patients’ ability to receive and adhere to treatment plans. Ofri spoke with Folks about her latest work, in which she explains why physicians can struggle to spend quality time with their patients, and how to improving the physician-patient relationship can lead to better treatment and medication adherence. This book began thanks to my last book, What Doctors Feel: How Emotions Affect the Practice of Medicine, after which I wanted to write about doctors and friendships. During my research, I found an interesting blog belonging to a doctor who wrote about befriending patients, including a patient who had been very difficult, and they had a lot of clashes in treatment. I started reading all sorts of doctor blogs and looking at comments from patients when it really hit me. It was like they told two different stories! Both sides had their shortcomings and often admitted them, but they still saw things so differently. It was like doctors and patients were filming a scene in a movie with two different cameras, almost like making a completely different movie all together. That got cut from my last book—the story of how they see things very differently—and I wanted to pursue that fully. It was like doctors and patients were filming a scene in a movie with two different cameras. I know it’s a lot to sum up so briefly, but why do you think patients and physicians have such different experiences during an office visit? For a patient, illness is the crisis of his life. For a doctor, it is one case on daily rounds. I might see 10 patients in a morning, so each patient is not the crisis of my life. The priority level is different, and the anxiety level is different in terms of where it ranks in my personal hierarchy. A patient may also want to tell the story of his whole life, whereas the doctor is focused on the useful aspects of the narrative in order to find a diagnosis and treatment. I wouldn’t call them errors, but doctors do come at it with a different focus, so they can be perceived differently. For example, a doctor may say, “Here’s your treatment,” and a patient may hear “cure.” Those are two very different things. How have you witnessed miscommunication between physicians and patients evolve over the course of practicing medicine? 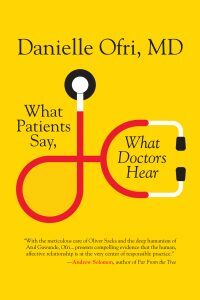 One thing I’ve noticed in general, and over the course of my research for this book, is that a patient will say something like, “I have this pain over here,” and immediately, the doctor jumps in, asking when did it start. On average, we physicians interrupt within 10 seconds. We want to track down the problem quickly, but in the process, we may take a patient down particular avenue when patient has something important to add, such as, ‘This pain makes me afraid of a heart attack” or some family history we need to know. For a patient, illness is the crisis of his life. For a doctor, it is one case on daily rounds. On the patient side, I like to have them think about the point of a visit. If you don’t have an approach, everything will be superficial. If you try and do many things, nothing will be in-depth. I suggest selecting one or two priorities to begin, and to think about telling your story, honing your narrative a bit. That said, patients should always feel free to ask their doctor to repeat something, whether it’s a description of their treatment or simply part of the intake or exam. If the doctor still isn’t listening, it’s time to get a new doctor. There’s an interesting chapter about patient non-compliance, and the statistics—that between 50-75 percent of patients may not adhere to recommended treatment plans—seemed surprisingly high. Why is that, and what can both parties do to meet halfway so that patients can be more fully invested in and empowered to control their own wellbeing? Cover to What Patients Says, What Doctors Hear. When it comes to medication adherence, if patients aren’t taking their meds, physicians may be well advised to normalize that taking medication is difficult. A patient may say, “It makes me nauseous,” and that is important for figuring out and addressing why there’s no adherence. Again, it goes back to listening, as well as asking the right questions. Sometimes you have to ask a question in different ways or go off-script. “What’s the hardest thing about having diabetes?” is an important question, and a physician might learn a lot from the answer—and also get a different answer than one might get from asking a standard question. That question is probably not on a medical chart, though. Another thing to consider is a patient’s background: where they live, what they do, are they a recent immigrant, are they homeless, are they caring for elderly parents, and so on. Asking these types of questions and understanding this personal information establishes a lot of respect. It demonstrates that the physician is interested and cares about them, even if there’s nothing a physician can do to help address any of these life circumstances. It is nevertheless a helpful method that pays off later in the relationship. What’s the balance for physicians between labeling a patient (i.e. “difficult”) versus keeping track of symptoms, life circumstances, and effectively conveying that personal information to other physicians who may also work with that specific patient and need some frame of reference? There are different kinds of labels to help keep track of patients and get the right referral. Sometimes it’s not that the person is a difficult patient; it’s that their circumstance is difficult, whether it’s something socioeconomic or medical, and that difference can impact how a patient needs to receive care. If my patient’s issue is poverty, I can’t do much about that. So whatever problems a patient mentions, I record them all. I recognize I can’t solve them, but it’s worth acknowledging, especially how frustrating must it be to get the right medicine while also looking for job or being a single parent. There have been studies on medication adherence, and how during an office visit, touching on non-medical issues improves adherence. It’s important for physicians to ask: how’s your work, how’s your family? Just by asking, you can immediately improve how someone will behave. It’s sort of the same principle as dealing with the cable company. If someone says, “I’m sorry you waited a long time; that must be frustrating,” your interaction changes. It’s important for physicians to ask: how’s your work, how’s your family? Just by asking, you can immediately improve how someone will behave. This type of understanding and communication lowers biological stress levels, and lowers anxiety and adrenaline. It helps the interaction, even if you can’t solve the underlying problem. I have patient who struggles financially who has diabetes, and I know when her government assistance check comes, she buys better food. Her condition is better managed based on certain times of the month. I know this by now because we can talk about it. I can’t change her benefits, but I can recognize what my patient is doing well. I also can’t solve the problem of getting her a job, which would help her health, but by being sympathetic ear, that is helpful. We as physicians can’t solve all those problems, but we can help change the concept of what is helpful. Many of my patients get disrespected when they are asked about their life, and I believe the doctor’s office is where they can be treated really well. How else has practicing medicine changed, in your experience, in recent years? The practice environment has changed a lot, putting a lot of additional administrative pressure on doctors. It’s not that we don’t want to sit and talk. It’s mostly that we’re forced to do annoying tasks to close out electronic medical records (EMRs). 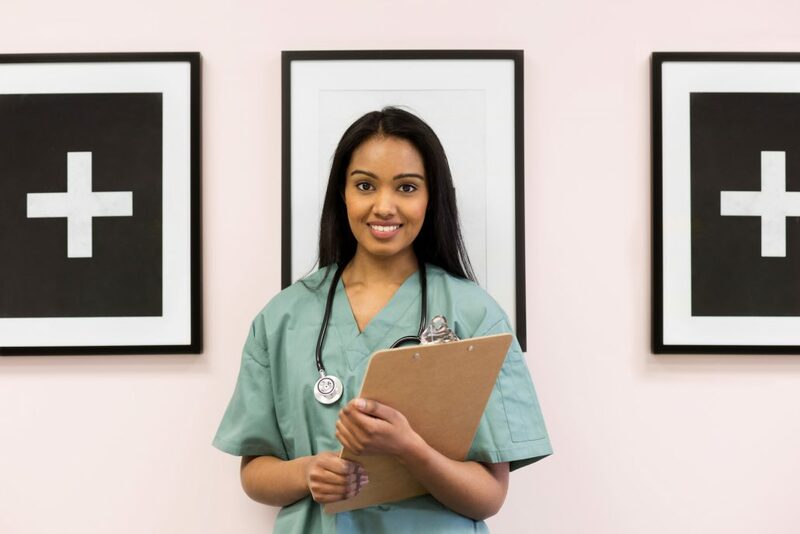 The template can make certain fields mandatory—that you must check certain boxes—and physicians end up forced to do mindless work they could be spending with their patients. The other day I had three new patients on the schedule, and because I wasn’t super busy, I could spend an hour with each one! I was grateful I could get to all of their issues, and it felt so gratifying because they benefited from the time I was able to spend with them. This is the medicine I wanted to do! We only have so many hours. But if I had an hour to talk with patients, I’d do great medicine. The sleep-deprived doc who is green with envy of his operating room patients’ chance to rest while undergoing surgery. The first year med student who is the child of refugees and struggled to treat veterans coping with the guilt of torturing captives—the very thing people in her family fled. The idea behind The Nocturnists is deceptively simple: the notion that doctors are just as fragile, funny, and human as their patients. 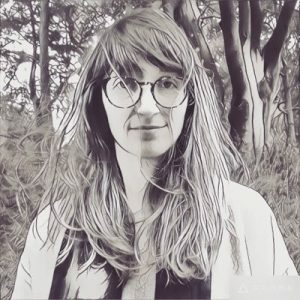 Emily Silverman, a third-year resident at the University of California, San Francisco, launched the cathartic Moth-style storytelling series for physicians in January 2016. Since the initial 40-person event in someone’s living room, the event has grown to fill small theaters in San Francisco, drawing an audience of 250. Silverman says that when patients meet physicians in a crisis or even during a checkup, it can be difficult to see the whole person behind the diagnostician. But the stories from past performances have been a wrenching look at how medical professionals deal with their work. 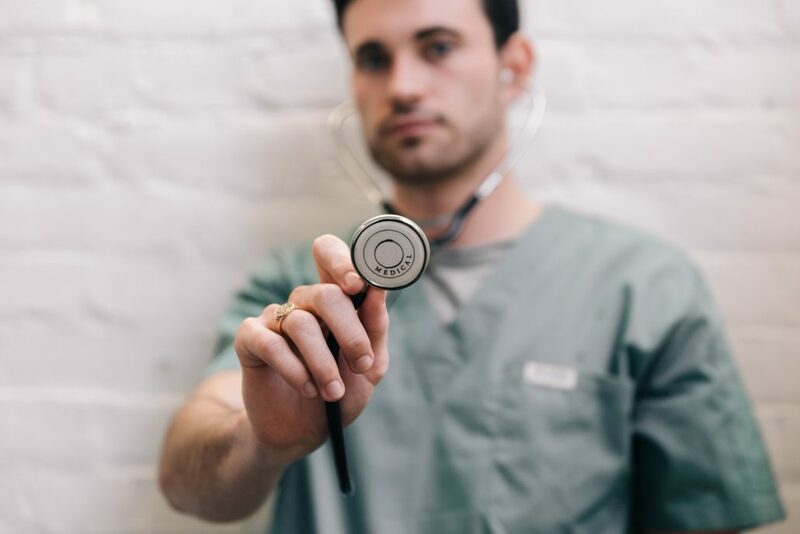 Physicians and patients are all human beings, and the series is meant to provide community to medical professionals while also illuminating both sides of the doctor-patient relationship. The next Nocturnists event will be a fundraiser for a local reproductive health non-profit, and in addition to high-priced tickets that will benefit the cause, a few seats will be available to the general public. Silverman says the best way to stay in the loop about events and tickets is to join The Nocturnists email list. She spoke with Folks about telling the stories of medicine from the physician’s side, obtaining consent, and what she’s learned from fellow medical professionals in slightly different fields than her own. What was your path to medicine? It sounds cliché, but I was one of those 5-year-old kids running around the playground saying I wanted to be doctor. I don’t know where it came from because parents weren’t physicians. My dad didn’t finish college and ran a hardware store, and my mom was social worker. But I had a pediatrician I idolized, and I always wanted to understand the machine of the human body and how it works. My parents bought me books filled with colorful diagrams and pullout tabs to learn about organ systems, and I watched Ms. Frizzle on The Magic School Bus. I simply had to understand how my body works. Even today, when there are things I don’t really understand like the economy or the Internet, when I look at non-physicians, I think: how can you not know where your uterus is? Even today, when there are things I don’t really understand like the economy or the Internet, when I look at non-physicians, I think: how can you not know where your uterus is? I was drawn to science, but in parallel, I had this creative side—not so much social science but purely artistic, in that I loved drawing and ended up majoring in art history. In college, I flirted with not being a doctor and going into the art world. I always had these two parallel threads in my life and wanted to find ways to overlap them. How was med school for you? I’m passionate about science and have a lot of curiosity, so I got interested in the humanistic side of medicine and the importance of shepherding people through certain life experiences. Medical school reinforced that. In med school, it was difficult to keep up with my creative side because I was studying all the time. I met a kindred spirit, Alessa, who also had a hidden artistic side and is extraordinarily funny. To keep our creative sides alive, we’d write scripts and make silly videos, and we always had a dream we’d write a film script about this stuff. Physician burnout is being recognized more now, as are the skyrocketing rates of depression and suicide among physicians. The intern year during my residency was very immersive, very intense, and a lot more difficult than I expected it to be. The sheer number of hours and the sleep deprivation and lack of time to process the experiences you’re having and the suffering that you’re witnessing—I actually think it’s really problematic. I dealt with emotional lag: like two weeks out of some intense experience, it would all come rushing back at an inopportune time. There’s not much time to talk with colleagues. Physician burnout is being recognized more now, as are the skyrocketing rates of depression and suicide among physicians. Some programs set aside time to talk to colleagues, but that’s still not a cure-all for working 80 hours a week. By the second and third year, the schedule opens up a little, and I was looking for a project to speak to the human side of medicine. There’s a lot happening in medicine right now on the scientific or business side, whether it’s in economics, digital health, genomics, or big data. That’s great, but I worry that stories of medicine are getting lost. I wanted to do something about that. Where did the idea for a storytelling series come from? Do you solicit stories from fellow physicians? 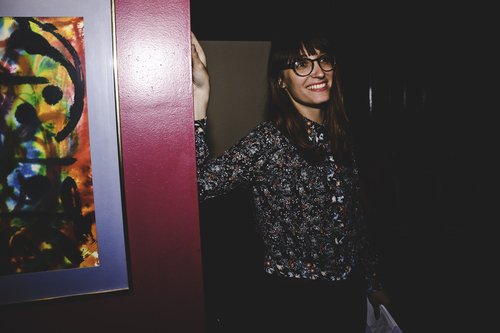 I was at a live taping of The Moth in San Francisco, and I thought, “Oh, that’s what I’ll do.” It just felt right. Going around SF, getting a sense of the cost to rent a space, it seemed daunting. I finally found a shared living space that has a parlor room that rents for something like $90 a night. That first event was about 40 people. I had to twist some arms to get people to show up, and especially to share. It wasn’t extraordinarily difficult, but it wasn’t people emailing to volunteer back then. I sent targeted emails to people who I thought were talented and who would have a good narrative sense with some wisdom underneath. The first event was very intuitive—there was no coaching—and people were very open to making themselves vulnerable. I lined up eight or nine residents but also faculty, and it was so helpful to have both, and it set a precedent for faculty to feel involved, and then we didn’t have a hierarchy where people didn’t want to participate in the same thing together. We use stories all the time in medicine. At first, my motivation was for therapeutic effect, telling stories in way very different from being in the hospital. We use stories all the time in medicine. A patient goes to the doctor and says, “I was fine, but then I was walking and I fell short of breath.” Patients bring that narrative to the doctor, who interprets it and strips away the inessential information so that the notes can become sterile and scientific, which is fine; Our job is about medicine and efficiency. It’s much more reductionist practice than expansionist practice. When we’re presenting a case on rounds, we retell patient story. We also tell stories and use metaphors with patients. I was wondering about all of this, because now electronic medical records are templated, and they are very hard to read and it can be very hard to extract narrative from a digital record. I thought, if we could get together and tell stories in a more expansive way in a theater with art all around as opposed to under the glare of the florescent lights of hospitals—and in normal clothes, not scrubs—and sit next to each other, shoulder to shoulder, and hear stories of our lives and jobs, that would be a good thing. That was the crude thought I had initially. As our events grew, I received emails from physicians but also nurses, social workers, paramedics, and physical therapists across the Bay Area. I realized there is a hunger for a narrative in healthcare, for the chance to come together to digest and absorb experiences from the hospital and to foster inter-professional understanding. In an academic institution, the atmosphere often feels fragmented and impersonal, and I wanted to bring people together. After the 2016 election, I also felt stories are important for advocacy. Are there any story topics that surprise you? We had an event in March 2017 with a justice theme, and some of those stories surprised me. In October 2016, our theme was death and dying, and I feel like I know those types of beautiful and powerful stories. In my work, I see people suffer and die all the time. At the justice-themed event, a clinical social worker told a story about a homeless woman who was his client and had a lot of psychiatric problems—someone is so vulnerable and so psychiatrically sick that she would have outbursts that made it difficult for her to go through life and get the things she needed. There was also this tenderness to their relationship—she referred to him once as her best friend—and when she could, she told him stories of how she helped others during the last major earthquake in San Francisco. Initially, he thought his job was to fix her, but getting to know her, he learned that his job is to make life easier for her, to make her more comfortable. There was another story from a psychiatry resident, Jake, who was essentially taking care of a young, schizophrenic black man who wouldn’t take his medication because of the side effects, and he had delusions about the police wanting to throw him in jail because he’s black. Jake talked about how difficult it was to talk to his client about this, given the real threat of police brutality and the Black Lives Matter movement. It was a complicated, nuanced story about being yet another white man trying to tell his black patient what’s good for him, and it brought to light the complexity of what we do that one can never do with data. Jake said after this experience, he will look for truth in delusion. What do you envision for the future? How hard would it be to replicate in other cities? I think a lot about whether to turn outward or to turn inward. By turning outward, I mean taking the show on the road to other cities, especially those potentially different from the Bay Area, or trying to get the stories on National Public Radio or a podcast. To turn inward and focus on my community, I ask myself: do I want to leverage this to make California or even San Francisco better? I think I would like to try turning out first, especially as people from other cities and states are interested in collaborating. Are there misconceptions about the series you find yourself explaining? First, there’s a lot of fear around making yourself vulnerable as a physician. We’re treated like super-humans, from working long hours to the fact we’re expected to operate on minimal sleep. We’re essentially operating at extremes at all times: emotional, physical and physiological. The white coat causes a certain power dynamic, and there’s also this idea that the physicians should be neutral, that we shouldn’t insert ourselves into the narrative. I understand the argument, but overall, I believe it is beneficial to recognize physicians are human beings, just like patients. Sometimes physicians are patients; physicians get sick, too. We talk a lot about humanizing the patient, but events like this have a role in humanizing physicians. We also talk about confidentially, which is hugely important. There’s no universal moral code but in general, we say to obtain written permission if you’ll be sharing anything identifiable. Or, you change the details. For example, if the patient is wearing a backpack, now it’s a necklace. If he’s from Nicaragua, now he’s from Mexico. You have to think: why am I telling this story? There should be a reason, and it should be your story, not someone else’s. I have to coach some people on that, that you have to put yourself in the story. I say things like, think about when you felt scared or vulnerable, or something that happened that changed your mind. Narrate your inner life. If you stick to that principle, it turns out pretty well.